One of the things everyone says about getting a CSA share is that it forces you to find new ways of using vegetables you may never have used in the first place. Sometimes this can be a good thing. One of the items we seem to be getting a lot of is arugula. We’ve used arugula in various ways before, but mostly in salads of various forms. 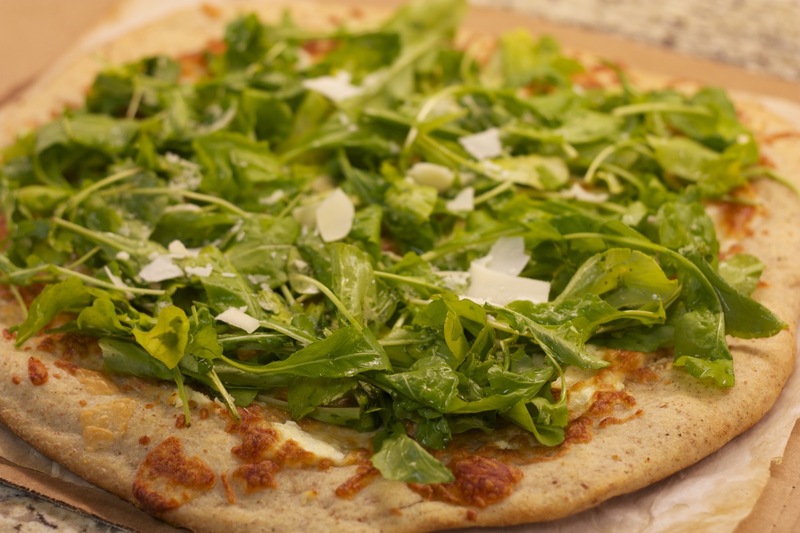 With a recent batch of arugula, I looked around on some of my standby sites and found this Lemon Arugula Pizza on TwoPeasAndTheirPod.com. The original recipe calls for squirting lemon juice over the pizza, which was the plan, but when it came out of the oven we forgot…by the time I realized, the pizza was gone…might add it next time, but delicious without it. 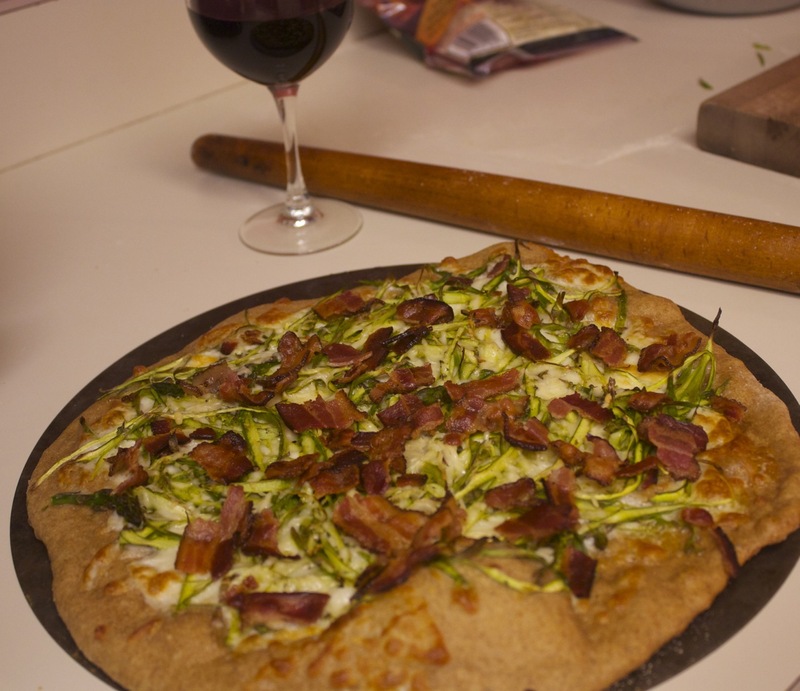 We typically use the no-knead pizza dough recipe in Mark Bittman’s Food Matters Cook Book, which is adapted from Jim Lahey’s recipes like this one. 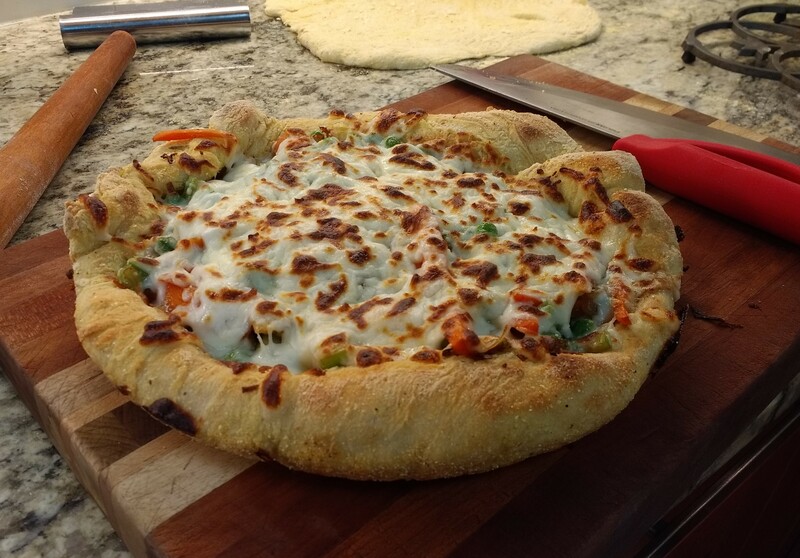 This time we forgot to make the dough an grabbed one from a local pizza place that sells dough. The pizza was excellent and even the kids who often balk at the spiciness of arugula ate it all up. I found this recipe on Once Upon a Cutting Board a while ago and have made it twice already. The first time I made it, I was looking for a potluck dish and had the ingredients on hand. But since I didn’t want to deal with transporting a pizza to a potluck, I rolled out the dough, cut circles out and lined muffin tins with the dough. I added topping and baked. They were a real hit at the party! 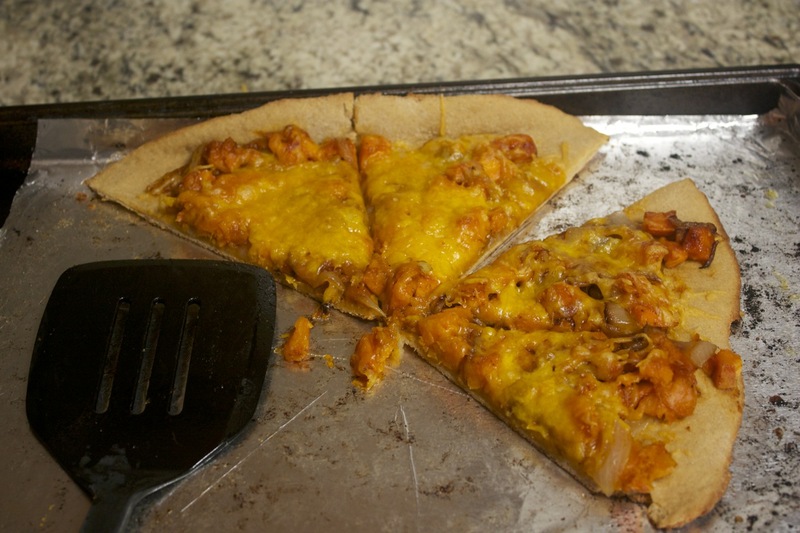 It was so good that we decided to make for dinner as regular pizzas. 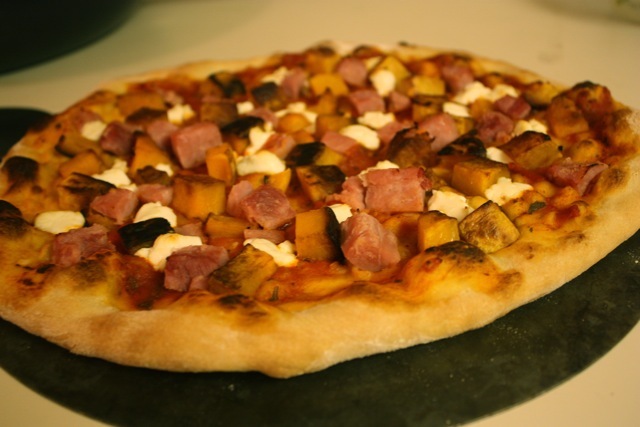 Preheat the oven to 375--if you are using a pizza stone, put that in now. Dice the sweet potatoes and toss with about 1 Tbs of olive oil. Spread on a baking sheet and roast for 20-30 minutes or until nicely browned. While that is cooking, heat the other Tbs of olive oil in a pan and sauté the onions on medium heat stirring occasionally for 15 minutes. Add a grinding of pepper and the sugar. Continue sautéing for another 15-20 minutes. The onions should be deeply browned. Once the potatoes are cooked, remove from the oven and bump the temp up to 450 or so to cook the pizza. Combine the sweet potatoes, onions and BBS sauce in a bowl and mix. If you are mixing muffins, add about half of the cheddar cheese here too. 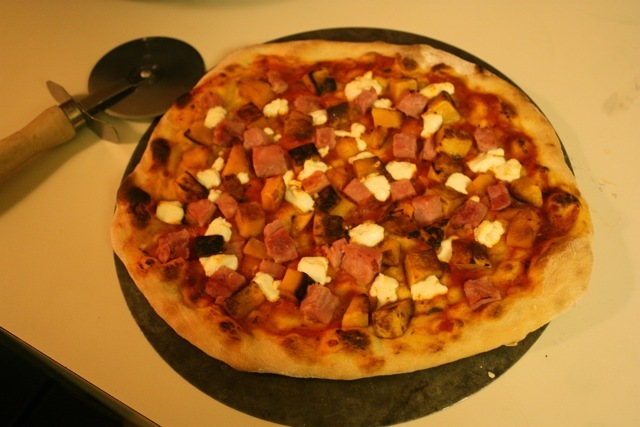 For pizzas, roll out the dough, top with the onions and potatoes. Top with cheese and bake. For muffins, roll out the dough, cut rounds big enough to line the muffin cups, and put the dough in the cups. Add the onions and potatoes, top with remaining cheddar and bake. Seems like we’ve been using a lot of bacon as of late, but at least according to this, undoubtedly unbiased, source, bacon is actually healthy for you! OK, maybe not really healthy, but it is really good and, in moderation, can it really be that unhealthy? The original recipe called for cream soaked mozzarella, but that seemed a bit excessive. All I’ve got to say is, there were no leftovers! 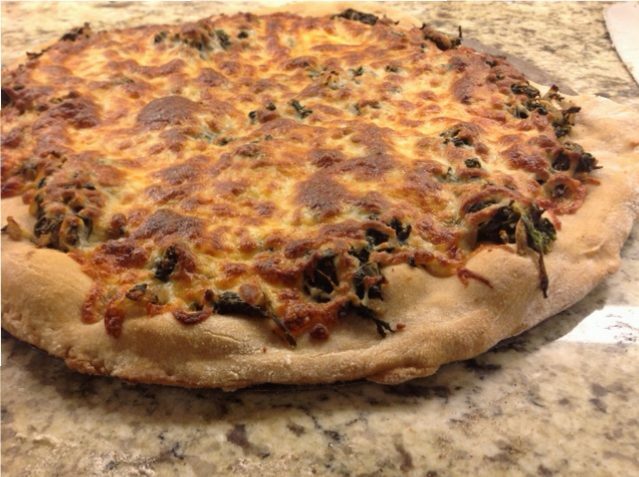 We make pizzas at home quite a bit, though tend to stick with the standard toppings–pepperoni, olives, mushrooms, etc. 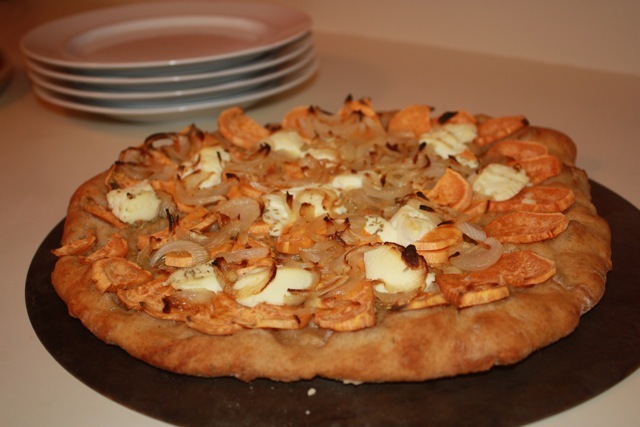 I was looking for something a bit different and ran across this recipe at Real Simple for sweet potato pizza with onions. 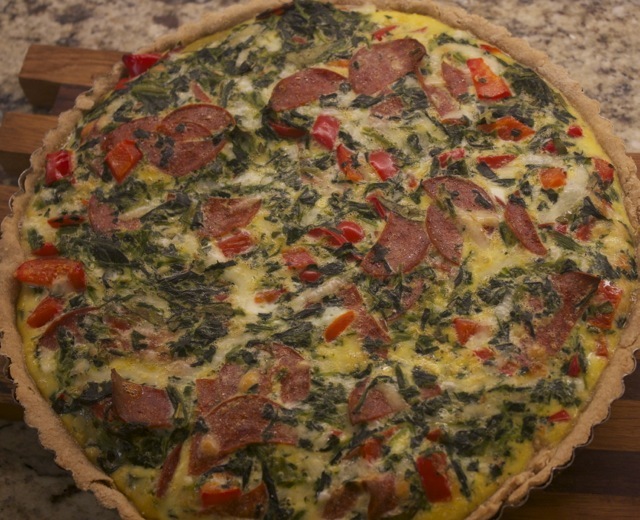 We added a few dollops of ricotta cheese since we had some left over from the quiche we made earlier in the week. For the crust we used a recipe from TFMCB: No-work mostly whole wheat pizza dough. 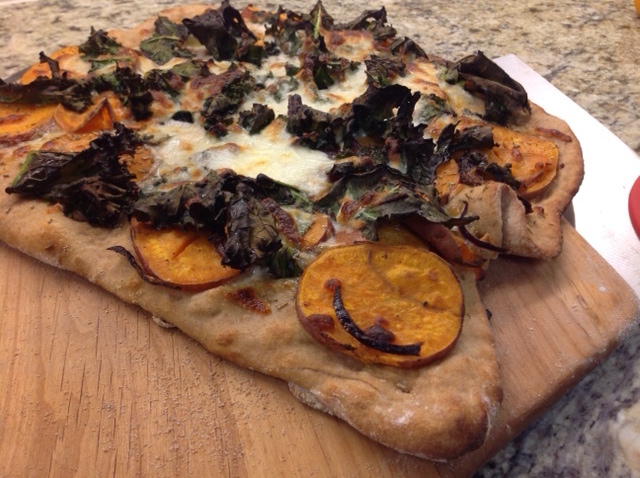 We did make a backup pizza for the kids, but the sweet potato one was eaten up!